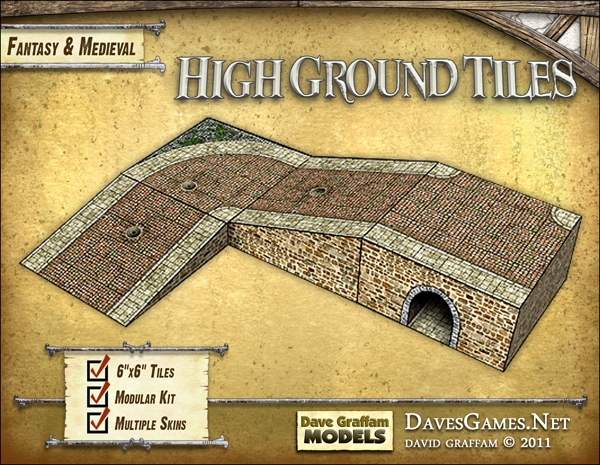 High Ground Tiles modular terrain kit released! Beautiful product, Dave. These, like all of your other fantasy themed buildings, should combine well with the Fat Dragon Dragonshire sets. Don't they use an 8" base? The earlier FDG stuff uses 8" base tiles, but the later sets have gone to 6" bases for more modularity. Werewolf8, user over at the FDG Forum, did an excellent tutorial for making a wide version of the Dragonshire foot bridge. You could use multiples for extra wide crossings. I agree. I would love to see a bridge made up of two ramps and a center piece. Then you could add in as many center pieces as you like. The drawbridge building piece could be used at the middle of a regular bridge, to facilitate river travel by masted ships, or as part of the Medieval city walls. I like the high ground tiles well enough, but I am wondering if there is a trick to getting them to come out with flat tops without resorting to foam board. Mine are plenty strong enough but came out bowed down in the middle. I have made four 1" high tiles so far from 110 Lb card stock. I strengthened the sides by folding over and gluing the bottom tab instead of cutting them off and strengthened the top by gluing a slightly smaller sheet to the bottom after attaching the sides. I assembled by attaching all the sides to the bottom side of the top piece, gluing the piece to strengthen the top, and then folding the sides in (scored ahead of time of course) and gluing the corners. Perhaps I should glue the sides together first and then attach to the top, or is there something else I am missing? I have also thought about putting something really heavy on top while they dry flat (or maybe using a dry iron) before folding the sides. edit: just in case it matters, I use Algeen's original glue and burnish with a rolling pin, use a piece of baking parchment to cover the top and bottom, before rolling up the sides. I apply the glue in a fine spiral bead but don't spread before rolling. I did take a piece apart to make sure the glue was well spread out from the rolling and it look good. Use two layers of cardstock. To join these, use a glue stick (or spray glue if you're brave). Aleene's is probably too wet for covering large areas like that, even with a brayer/roller. When applying the glue stick, just go quickly around the edges and a quick zig-zag in the middle. Flatten it under a heavy book for a few minutes. The cardstock sheets should fuse and remain flat. If they're still not sturdy enough, a third sheet of cardstock might be needed. But I think you'll be okay with two. If you need some reinforcement inside the tile, I think the set includes some blank side-wall pieces that can be printed on cardstock and placed inside. It may be the strengthening that's making them bowed.... the more water based glue you use the more you risk warping. May be better to leave out the strengthening layers and use support posts instead. IF you do want to add layers, then spray adhesive is much better as it's solvent based and the card doesn't warp. Also, if you burnish too much you can add a curve to the card.... really useful when you want something to roll into a cylinder, but not so good when you want it flat. Try just using scrap paper over the tile and giving it a press with the flat of your hand (or leave some books on top) using a rolling pin will encourage paper or card to curve in the direction of the roll. Same technique used to curve sheet steel! Thanks for the quick replies. Can't wait to get home and try it out. I have some experience with spray glue from my old photo shop days so I will try that first. 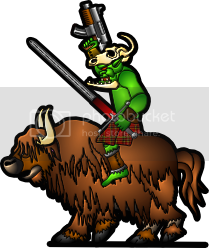 Should I use that for attaching the sides to the top as well? It's a huge advantage when sticking anything large down or laminating layers.... any glue with moisture in it will naturaly make the paper/card warp as it soaks into one side and swells the material unevenly. Same reason you presoak paper before watercolour painting. There's no water in spray glue so it works much better. I'm currently working at 15mm and I've replaced foam board with magnetic paper which is nice and heavy but really thin. Have you tried glue-pens? They seem to have a lot less moisture in them and work really well for figures and buildings. I use UHU ones for stuff that's too precise to use spray mount on. I think that's the same stuff. I use it on buildings and figures, you use a think layer and it doesn't get things as wet as white glue. note: My new papercraft hobby is all about adding more variety to our Mordhiem games. That's what we used it for...... but we used a terrain cloth as the base and totally covered it in Dave's buildings. That is my plan. Which terrain do you think gave the greatest benefit to gameplay? My plan is to start with the ruined buildings set. I am especially excited about the possibilities of the Tower Ruin but many of them look like a lot of fun. The tower is awesome and becomes a key terrain piece whenever it's used (Hochland long rifle!). I'd start with a tower and one of the ruined houses then lots of 'crosspiece ruins' they are really flexible and by arranging them cleverly the board rapidly starts to look like a huge complex ruin. They are one of the cleverest, easiest to assembel terrain pieces I've seen. It's only when you've made a few up and laid them out that you see it. Four or five archways in a row look like a ruined cathedral, one archway and a flat wall and you've got a cottage. Spray gluing and pressing with a book worked great. I highly recommend baking parchment when pressing pieces together as glue doesn't seem to stick to it hardly at all. I just noticed yesterday that my inkjet (Canon mx860), even on the fast setting, seems to get the cardstock wet enough that it bends slightly. Spay gluing the printed sheet to another sheet of card stock helped flatten it out. In the future, I think I will switch to printing on paper and attaching that to card stock. I also started on the Wrecked House. These sheets really came warped off the printer (I think it uses a lot more ink). After gluing the backs to the fronts and pressing, everything seem to flatten out perfectly. Also, the cut lines were really hard to see in many spots (perhaps printing on normal paper will help this). On my computer screen they are easy to see so I think it is a printing problem. BTW, I love all the little extra bits. I am gonna make a whole sheet of the small crates (that came with the wrecked house) to replace the treasure tokens we have been using. We tested the bridge that came with high grounds with our heaviest 30mm metal ork figure (thing must weigh at least a pound) and it didn't flex even a little ;D. Bridge was built to spec without any reinforcement.